Wat Phra Kaew, Na phra Lan Rd, near Sanam Luang, 02-222-0094, daily 8:30am-4pm ,B250 includes entry to Vimanmek Mansion, dress respectfully. The granddaddy of all Thai sights. Don?t let the touts who mill around outside put you off a visit to this, the Kingdom?s holiest and most beloved keepsake ? a fantastical 218,400 sqm royal complex that comes enclosed by quaintly crenulated white-walls, and at night sparkles like the jewel in some Oriental fairytale. Building began in 1782, the year Bangkok was founded, and every monarch subsequent to King Rama 1 has expanded or enhanced it. Today, despite your being able to visit many stunning sights on its grounds, much of it remains off-limits. 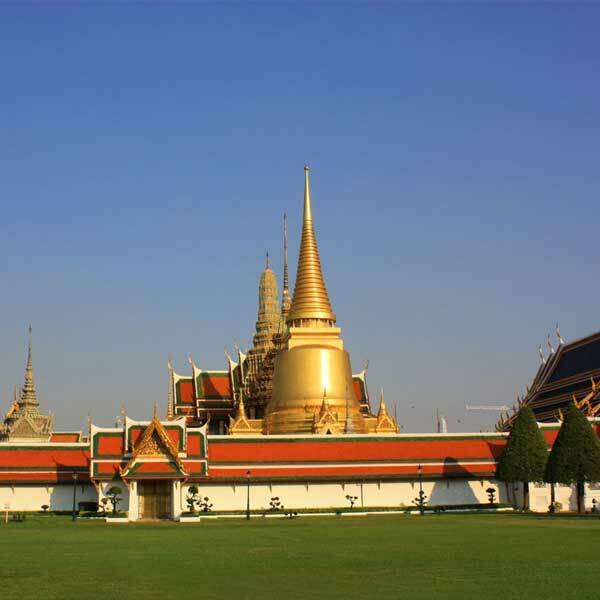 Though the current king now holds court at Chitralada Palace, in the northern district of Dusit, the Grand Palace is still used for major ceremonies or royal functions. The highlights is the Emerald Buddha ? Thailand?s most sacred Buddhist relic ? and the ornate temple purpose-built to house it, Wat Phra Kaew, where hundreds pay their respects each day. This was completed two years after the capital was moved from Thonburi to Rattanakosin in 1784, and forms the northeastern corner of the complex. Remember to dress respectfully ( a strict no shorts or sleeveless shirts policy is enforced ). And for a wide, panoramic perspective try looking back while stood on Sanam Luang, the ancient public green used for royal ceremonies and political rallies. Seen from here , the complex?s many flame-shaped roof eaves and gold-mirrored chedi, which glow an iridescent orange at night, are no less awe-inspiring.